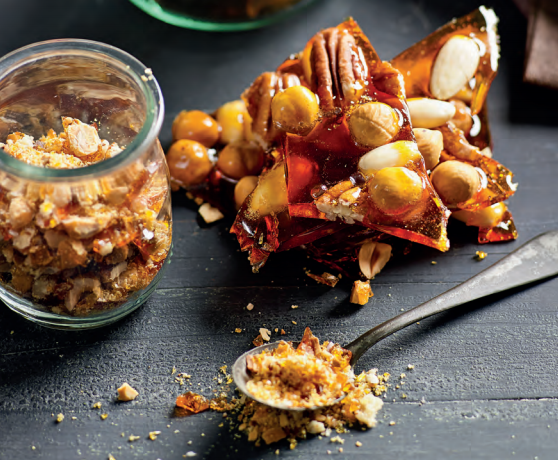 4 Ingredients to Praline Heaven… well, 5 including water! Line an oven tray with baking paper. Scatter all the nuts over the tray. Put water and sugar in a small saucepan over a low heat and stir until sugar dissolves. Bring to the boil, without stirring and cook for about 15 minutes or until mixture turns a golden-amber colour. Set aside for 1-2 minutes until the bubbles subside. Delicious on it’s own, or with some vanilla ice cream. Happy days! Been getting Pepper Leaf for 10 months now for our family of 4. We cannot fault it! Far superior to Marley Spoon in terms of: 1. quality of fresh produce and meat; 2. size portions of carb/protein/vege; 3. interesting recipes which are still appealing to children; 4. easy to follow cooking instructions for non-cooks; 5. personal customer service; 6. packaging that is mindful of the environment; and 7. value for money. Both husb and I work full-time in demanding roles and having fridge/freezer stocked with the meals for the week early on Sat helps stay sane. Please keep up the good work - we LOVE Pepper Leaf! PS. Our 14 year old daughter cooks the evening meal on a Wed, due to Pepper Leaf! I would be lost without Pepper Leaf!! I have tried a couple of others before Pepper Leaf and they just don't compare! It is always a drama trying to figure out what to cook, with Pepper Leaf they do the thinking for me and everything that we eat is healthy and tasty! Pepper Leaf is easy and the recipes are great!! Would recommend to EVERYONE!